Finding a place to work in a major metropolis like New York City can be a challenge, and an expensive one at that. At first glance, options may seem limited, but if you look a little closer, maybe the perfect place to work was there all along. Preston Pesek, co-founder of Spacious Coworking, saw past property challenges and found that there was actually plenty of space, depending on how you look at it. Setting up coworking spaces the City’s restaurants during the day, Spacious takes a novel approach to how we get the most out of urban landscapes. 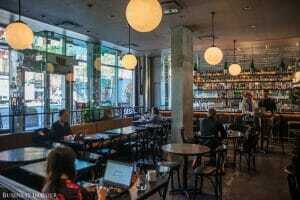 Realizing that many of these top eateries are pretty much empty until 5PM, until the after work rush, Spacious aims to combine business and pleasure. Hi, Preston. What inspired you to start Spacious? I have a background in commercial real estate. It was through this lens that I began to realize that beautifully furnished, street-level retail space, which often stays closed until 5:00pm or later, is actually some of the highest value property that has been programmed the least efficiently. With the rise of an independent workforce, in the context of a technological culture where people can stay productive and connected from anywhere, the opportunity to tap into the potential of these under-used spaces quickly became obvious. 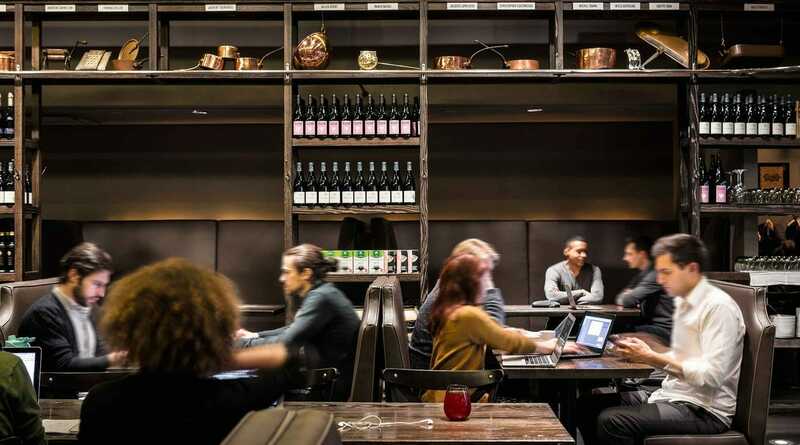 Does the coworking element offer any specific benefits to the restaurants, such as financial incentives? Not only do we share our profits with our restaurant partners, but they also benefit from greater visibility through our digital marketing efforts. In addition to more exposure, the restaurants can also serve food and drinks to our members during the day as well if they want. In most cases, our partners are very excited about the opportunity to serve small plates during the day, and our members love it too. How long do you occupy each restaurant? And, does the offer change after a certain time, or do you have a set network of restaurants ? We open at 9:00am, and for anyone who lingers after the restaurant opens, can simply choose to stay and order from the menu, or from the bar. Most of our restaurant partners like to have a few early customers to jumpstart the evening. When we add a new partner, we expect that it remains in the network through the remainder of the restaurant partner’s lease. The network grows over time, so we will be continually adding new locations, resulting in increasing network coverage in each city where we operate. Coworking communities rely on their hosts to help members integrate and build community. Since your hosts aren’t with the coworkers for an extended period of time, is it harder for them to connect with members? On the contrary, the hosts who greet and help to check-in our members are dedicated Spacious employees, so they are there every day. They get to know our members quite well, and as they are with them throughout the day, they act as a friendly concierge and reception for both our members and their guests. All of our hosts know almost everyone by name, creating a friendly and hospitable experience. Are these hosts already experienced coworkers or are they also new to the concept? The Spacious hosts are a diverse mix of independent freelancers, theater and film actors, designers, etc. who understand the need for an affordable place to meet and work that also acts as a social space. Some of them are new to Spacious, of course (because we are new), but everyone already has previous knowledge and experience with coworking. Who are your typical members? What are their professions? We have a diverse membership. We have independent designers, makers, and developers, as well as members of small to startup teams. We even have employees coming from larger organizations who have a “work from anywhere” corporate policy, who enjoy the fact that Spacious offers an experience that is more hospitable than the typical office. Do they work from home, or are they also experienced coworkers? Many of our members have also worked out of other coworking communities before joining us. The value of what we can offer, because of our unique business model, matched with high-touch quality experience, is something that sets us apart from many others in the space. Not many other coworking spaces can say that they are connected to a Michelin star kitchen. What are some of the things that professionals in NYC need but doesn’t have access to through the established coworking networks? Objectively, we solve the problem of finding a reliable network of places to host face-to-face meetings. While we don’t offer a permanent workstation where you can leave your computer overnight, we do offer a network of places where you can meet with others in a space suitable for any client, colleague, or friend. At Spacious you can choose to stay quietly productive at a table of your own, or engage in collaborative conversations in a space that is designed for social interaction. Of course, you can also choose to stay quietly productive at a table of your own, or engage in collaborative conversations as we create an atmosphere designed for social interaction. NYC has a lot of coworking spaces already, what did it take for you to realize a concept that would stand out and ultimately thrive amongst the competition? The business model we’ve designed allows us to offer something truly special that few others can. We also offer this at a price that is very hard to beat. The Spacious network will show you where the best spaces in any city are located, and these spaces are picked to be both beautiful by day, and also by night when they become top tier restaurant venues. Because we carefully curate our space partners, you can rely on Spacious to give you insight into “where to be” in any city. We hope to become an insider’s guide to the best spaces in cities all over the world. How have people reacted to the Spacious concept so far? And, do you have any plans to start using other non-traditional spaces in the future? Our members love it. It’s something very unique, but it also allows our members to feel that they are at home, and are proud to tell others about where they work. It’s a kind of “life hack” that is also an exciting movement. As our membership grows, we’re going to want to offer 24/7 access to the Spacious network. This move will require that we find other spaces, and there are plenty of those to be found if you have the right kind of perspective. To us, every city looks very spacious!